The auditory system (i.e. 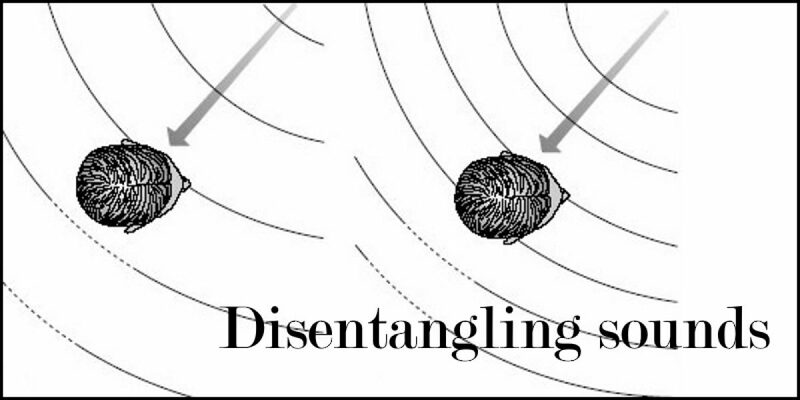 the sensory system for hearing, including the ear and the brain) has evolved so as to avoid a serious potential problem: disentangling sounds. Unlike our eyes, our ears cannot be directed so as to avoid registering material that we wish to ignore; whatever sounds are present in the environment, we must inevitably be exposed to them. In a busy setting such as a party we are swamped by simultaneous sounds – people in different parts of the room all talking at the same time. It is the possession of two ears that has provided the basis for a solution. Figure 1. 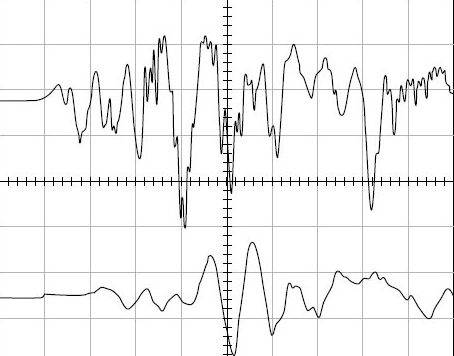 The waveform of a hand clap, recorded at the left (upper trace) and right (lower trace) ears. Horizontal squares represent durations of 500 microseconds (a microsecond is one-millionth of a second); vertical divisions are an arbitrary measure of sound intensity. Figure 1 shows a plot of sound waves recorded from inside a listener’s ears. You can think of the up and down movements of the wavy lines as representing the in and out vibrations of the listener’s ear drums. The sound was of a single hand clap, taking place to the front left of the listener. You will notice that the wave for the right ear (i.e. the one further from the sound) comes slightly later than the left (shown by the plot being shifted to the right). This right-ear plot also goes up and down far less, indicating that it was less intense, or in hearing terms that it sounded less loud at that ear. These differences, in timing and intensity, are important to the auditory system, as will be explained. Figure 2a represents sound waves spreading out from a source and passing a listener’s head. Sound waves spread through the air in a very similar way to the waves (ripples) spreading across a pond when a stone is thrown in. For ease of drawing, the figure just indicates a snapshot of the positions of the wave crests at a particular moment in time. Figure 2. Curved lines represent wave crests of a sound approaching from a listener’s front left. In (b) the sound has a shorter wavelength (higher pitched) than in (a), so waves are closer together, with a crest at each ear. The ear further from the sound is slightly shadowed by the head, so receives a somewhat quieter sound (as in Figure 1). The head is not a very large obstacle, so the intensity difference between the ears is not great; however, the difference is sufficient for the auditory system to register and use it. If the sound source were straight ahead there would be no difference, so the size of the disparity gives an indication of the sound direction. A different wave part (crest) has reached the nearer left ear than the further right ear (which is positioned somewhere in a trough between two peaks). Once again, the inter-aural difference is eliminated for sounds coming from straight ahead, so the size of this difference also indicates direction. Why should we make use of both intensity and wave position differences? The reason is that neither alone is effective for all sounds. We have already noted that the head is not a very large obstacle; what really counts is how large it is compared with a wavelength. 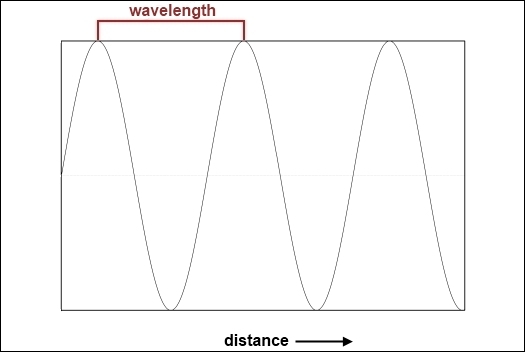 The wavelength is the distance from one wave crest to the next (Figure 3). Sounds that we perceive as low pitched have long wavelengths – longer in fact than the width of the head. As a result, the waves pass by almost as if the head was not there. This means that there is negligible intensity shadowing, so the intensity cue is not available for direction judgment with low-pitched sounds. In contrast, sounds which we experience as high pitched (e.g. the jingling of coins) have wavelengths that are shorter than head width. For these waves the head is a significant obstacle, and intensity shadowing results. To summarize: direction finding using intensity shadowing cues is effective only for sounds with short wavelengths (i.e. high pitch). In contrast to the intensity shadowing effect, detecting that the two ears are at different positions on the wave works well for long wavelength sounds. However, it produces ambiguities for shorter waves. The reason is that if the wave crests were closer than the distance from ear to ear, the system would not be able to judge whether additional waves should be allowed for. Figure 2b shows an extreme example of the problem. 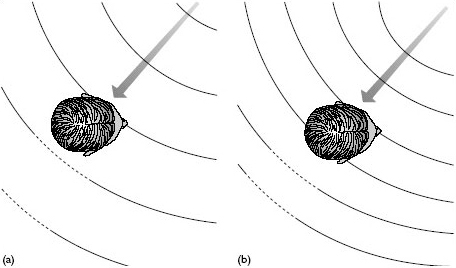 The two ears are actually detecting identical parts of the wave, a situation which is normally interpreted as indicating sound coming from the front. As can be seen, this wave actually comes from the side. Our auditory system has evolved so that this inter-ear comparison is made only for waves that are longer than the head width, so the possibility of the above error occurring is eliminated. To summarize: direction finding using wave position cues is effective only for sounds with long wavelengths (i.e. low pitch). Notice that the two locating processes complement each other perfectly, with the change from one to the other taking place where wavelengths match head width. Naturally occurring sounds usually contain a whole range of wavelengths, so both direction-sensing systems come into play and we are quite good at judging where a sound is coming from. However, if the only wavelengths present are about head size, then neither process is fully effective and we become poor at sensing the direction. Interestingly, animals have evolved to exploit this weakness. For example, pheasant chicks (that live on the ground and cannot fly to escape predators) emit chirps that are in the wavelength range that are difficult for the auditory system of a fox to process. The chicks’ mother, with her bird-sized head, does not have any problems at the chirp wavelength, so can find her offspring easily. Table 1 summarizes the effectiveness of the two processes in locating sounds of different pitch. Table 1. Effectiveness of sound locating processes. This article is adapted from ‘Attention’. An OpenLearn (http://www.open.edu/openlearn/) chunk reworked by permission of The Open University copyright © 2016 – made available under the terms of the Creative Commons Licence v4.0 http://creativecommons.org/licenses/by-nc-sa/4.0/deed.en_GB. As such, it is also made available under the same licence agreement.